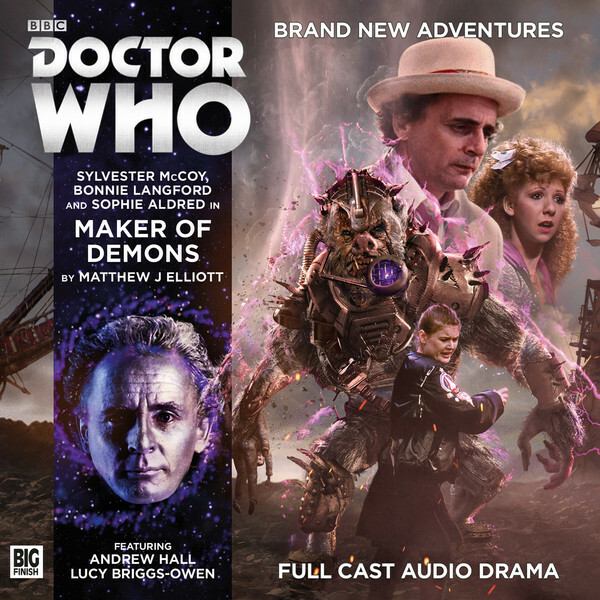 Matthew J Elliott brings the Seventh Doctor, Ace and Mel trilogy to an end with Maker of Demons. It offers a less explored angle on the Doctor and a good mix of dark story with lighter, though grim, dialogue. In some ways it’s Doctor Who and The Tempest, but in a good way. Unlike Forbidden Planet there are no robots; apart from that it’s hard to find fault with this story. So, the Doctor made a mistake and left the colonists to a war. Not the best day’s work perhaps, and one that weighs heavy on his mind as they come to grips with the changes on planet Prosper. The story quickly introduces a range of characters, most of whom raise a flag in the listener’s mind. There is a lot of intrigue and a nasty mutated alien race in the form of the Mogera. The Doctor focusses on making amends much to the disapproval of local chief scientist Juno (Rachel Atkins), while Ace gets to know more of the locals, including the helpful Miranda (Lucy Briggs-Owen). Ace meantime gets lost, presumed killed, as she wanders the wastelands (nearly as bleak as Perivale) and meets the Mogera in the form of Talpa (Ewan Goddard). Layers of intrigue and deception are pulled back before the ending. The four episodes flow well and the overall story is very satisfying. I’m very taken with this Mel + Ace trilogy and hope it returns soon. The Doctor is wrong footed and Sylvester’s part is not dominant in this story. To compensate both Ace and Mel have a good range of action, dialogue and chances to show more maturity than was ever possible on TV. Sophie in particular is an Ace with both wit (or sarcasms) but also compassion, while Mel does a lot more than just fall into peril. Matthew J Elliott’s writing helps, but (and listen to the interview) the actor’s craft is key. This is a good TARDIS team and they deserve more. Ken Bentley’s direction helps everyone turn in solid performances, but I most liked (and it was close) Andrew Hall as Alonso / Caliban / Gonzalo whose delivery was charming and sinister, Rachel Atkins scientist was hard-nosed, hard to impress and didn’t soften unnecessarily. She had her own agenda and came across as a real person whose concerns were wider than the immediate story. Finally Lucy Briggs-Owen gets to play a different kind of character from other Big Finish releases. The music and soundscaping are often brilliant and I appreciate the inclusion of the music suite on many titles. I have to admit to not always listening to them, but recently a few have grabbed my attention. This is a superb example and both music and sound design are by Nigel Fairs. A very strong product.